I always order scones in any little coffee shop or bakery that offers them. And, I regularly swear that I'll double the recipe next time I make scones at home, but I always forget ... then, live to regret it. Why? Because most scone recipes only yield about eight servings. That's never enough. Ever. 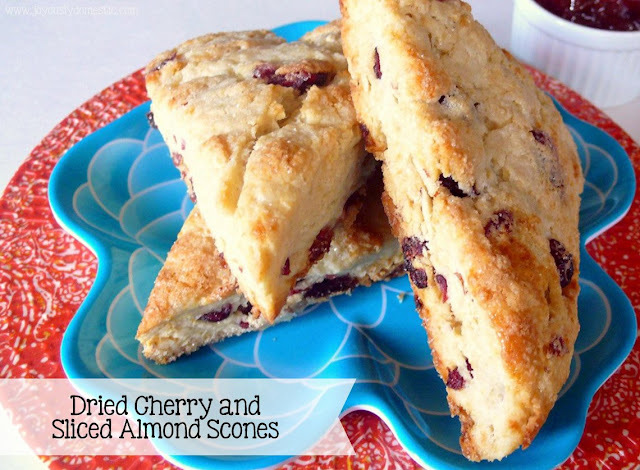 These scones are tender, buttery and flaky with just the right amount of sweetness. So many people think that scones are difficult to make at home. I promise you that they are not. The most important factor to making scones is keeping the butter as cold as you possibly can throughout the whole preparation. Scones come together and are in the oven in a matter of like, ten or fifteen minutes, so they are not time-consuming to make at all. For these scones, I took my blueberry scones recipe and tweaked it a bit. And, even though the name of the recipe says cherries, I actually used a combination of dried cherries and dried cranberries today because I love the combination of the two. And, I added in sliced almonds, but you could omit if you're not into nuts. Chocolate chips would be a good substitute or addition - yum! Blend together the 2 cups of flour, baking powder, the 1 tablespoon of sugar and salt in a mixing bowl. Cut in (with a pastry cutter or fork) the butter. Do not incorporate the butter completely. You want little pea-size bits remaining. Then, stir in the heavy cream just until you can bring the dough together into a soft ball. It will still look crumbly a bit. That's what you want! Do not over mix! Work quickly so that butter does not lower in temperature. Gently combine in the cherries and the almonds until just incorporated. Turn out your dough onto a lightly-floured surface and bring together ... patting it into a circle as you go. You're looking for about a half-inch thickness. Cut with a long, sharp knife as you would cut a pizza. Cut into eight triangles. Brush tops with milk or cream, then sprinkle with a light dusting of sugar. NOTE: I allow my scones to sit in the freezer for about 5 minutes prior to baking to ensure that the butter is very cold at the start of baking. Cool on a wire rack prior to serving. NOTE: A confectioner's sugar and milk glaze can be drizzled over the scones once cooled, if desired. The scones can be served as-is or topped with some lovely preserves. What a fantastic looking breakfast.